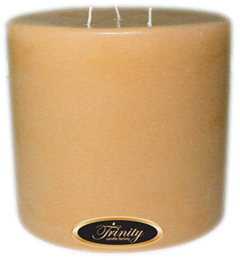 Trinity Candle Factory Premium Scented Sandalwood - Pillar Candle - 6x6. This 6x6 Pillar Candle is premium scented for maximum fragrance throw. With a 300+ hour burn time, cotton wick and premium scent, this candle has 3 wicks "The Original Trinity Candle" and an absolute must. Our Sandalwood fragrance is a nice, earthy and woodsy blend all rolled into one great smelling fragrance. An all time favorite. 100% Satisfaction Guarantee. No need to even light these candles. They are already so fragrant. 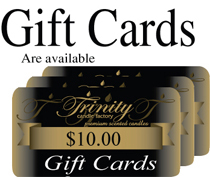 Trinity offers the best candles.